End of November 2009, its farm estate of 27516 m2 was ready again for the world. Hotel Casona del Patio Terrace. Casa Patio view from street. 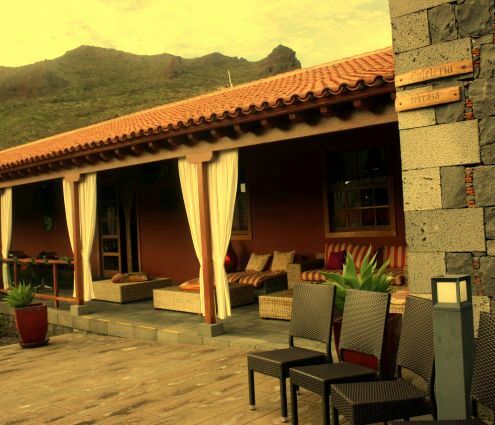 Its finally finished rural hotel in the town Santiago del Teide on Avda .General Franco opened its doors shortly after. Admire more lovely country side of green farmlands of the Teno Valle de Arriba in the neighborhood of the house of the Patio. 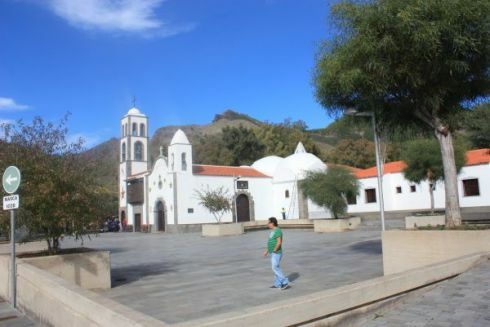 The region which includes Masca is highly popular for hotel guests who love to walk as well as to explore. In 2003, plans to restore the ancient country mansion got under way. Costs of EU 5,5 000 000 were estimated at that time. Finally, the Patio house of the 17th century became reality. Also the Island Cabildo had to be thanked. Now, even the rear of the so called La Casona the mansion looks good. La Casona del Patio seen from the back where it looks bigger than in the front. It also seems to be the ideal ground for a horse Rodeo or the like. 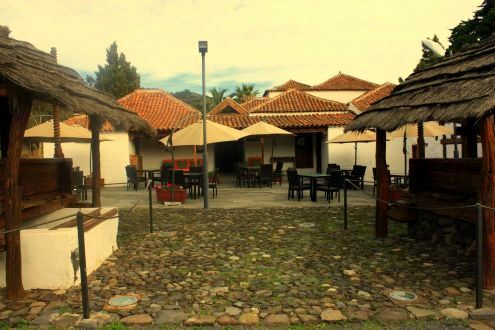 A good restaurant for casual visitors as well as hotel guests with Mount Chinyero sights from its veranda. 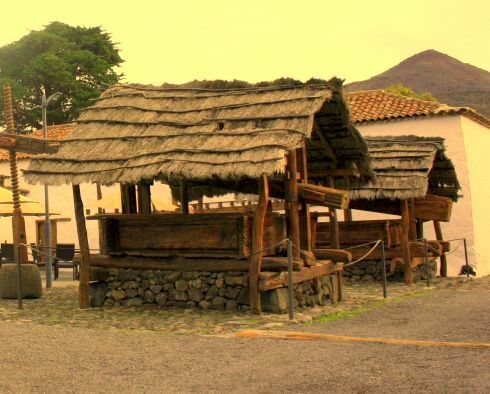 Museum of 1909 volcanic eruption of Mount Chinyero. Wine museum with Tenerife wine tasting which opens from 8a.m.-6p.m. Sale of local pottery, embroidery, Tenerife goat cheese, Cerrano hams, sausages, local liquors, Bienmisabe, honeys, wines, fruit and more. Ample parking ground and hotel access for the disabled. Experiencing rural Tenerife by horse riding away from tourist hot spots above the town of the giant cliffs. 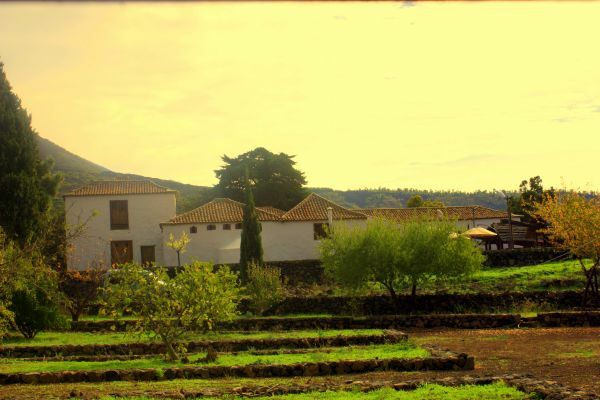 The old 'House of inside court yard' farm mansion reveals more than any other Tenerife country estates of times of feudalism gone by. 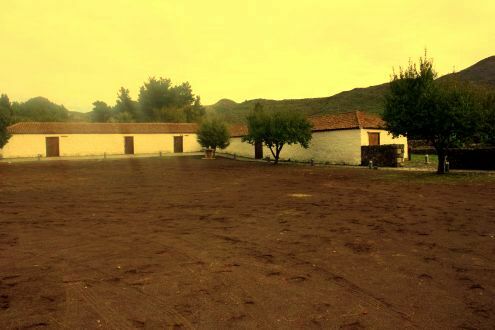 Farm feature of XVII century Tenerife manor. So are the structures above which were in use 300 years ago. On 3rd of July 1663, Fernando de Hoyo y Solórzano became Lord of the manor of 27,000 square meters of land for 3200 silver ducats. He paid to the Royal House of Spain through the ex military leader. 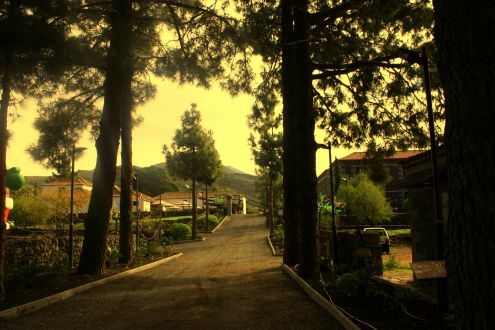 The latter had become governor of the district Santiago (del Teide) and was a family connection of Don Fernando. From there on, the family de Hoyo y Solórzano Lords of Casa del Patio had exercised feudal law in their land for a very long time. Guanche survivors after the defeat of their leader Mencey (Diaz) Pelinor de Adeje became farm slaves, often. Many may have ended up on this biggest farm of Santiago del Teide. A church parish was founded on September 9th of 1679. The Bishop Bartolomé Garcia Jimenez saw to this within an area which was sparsely populated and had little water nearby until much later by 1950. Don Fernando de Hoyo de Solórzan agreed to built the church San Fernando Rey ( King) next door of his farm house. However, the famous chapel Ermita de Santiago apostle which is related to a miracle was never incorporated. It helped indirectly to save his farm and people from the lava of the Mount Chinyero eruption. It is still in the rural village Valle de Arriba. Also important for the old manor were later times that have been reported in the history of the biggest Canary Island. You can see pictures and learn what's new at the Patio estate with its 40 bedrooms on 3 levels here. Hacienda de la Pared and Hacienda de la Gorvorana.